NOTE: To read a document in PDF, click on this icon next to the document topic, and your PDF reader should do the rest. If you do not have a PDF reader, you can download Adobe Acrobat Reader for free from the Adobe website. Two types of Fandrich desailers reduce the wind resistance of trees to reduce blowdown by removing the top of the trees or only the topmost branches. 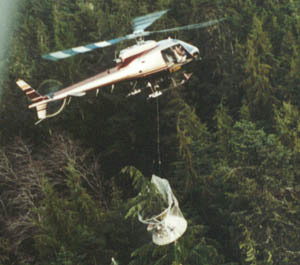 Helicopter pilots gain access to the trees quickly and can desail 100 to 120 trees per hour. The Fandrich Delimber is lowered over the tree and then pulled up. The specially designed upward-facing knives on the triangular head cut the branches using helicopter lift. The Fandrich Delimber requires no electrical hookup to the helicopter. When the delimber is pulled straight up, only the ends of the branches are cut, leaving about 3 foot branch stubs around the trunk. If more of the branches are to be removed, the pilot pulls the delimber over so that the tree goes into one of the three comers in the head. About half of the branches are then cut near the trunk. If the other half of the branches need to be short, the pilot lowers the delimber again, moves the tree into the opposite opening in the delimber head, and lifts up again. The delimber weighs about 300 pounds. To operate a Fandrich Topper, a pilot lowers the topper over a tree and uses a switch to activate a hydraulically operated cutting head which is powered by a Honda engine. An arm encircles the tree, a blade severs the top, and the top drops to the ground. The pilot then releases the switch and the arm opens automatically. The topper is used on slender tops since large branches will stop the topper from dropping further. 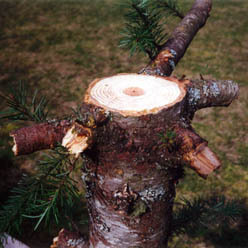 Although the blade will cut 9-inch-diameter trunks, the size of cut is often limited by how far the topper will drop. A heavy steel ring mounted on the base of the topper increases penetration. The topper weighs 580 pounds with the extra penetration ring and 345 without. The Fandrich Topper requires a constant 24 volt power supply and a supply controlled by a switch. The wiring is the same as on the Manual Unload Fandrich Shear. Fandrich delimbers remove branches on the way up. Pilots gain quick access to selected trees. Fandrich Toppers sever tree trunks in about six seconds. 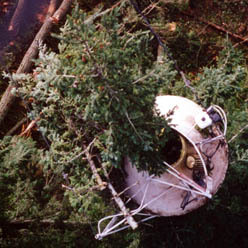 A desailing operation is a fast and easy way to significantly reduce the potential of a blowdown beside a newly felled area. 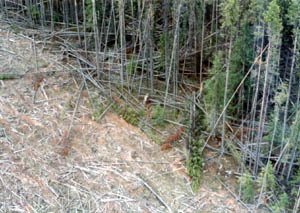 The following pictures were taken on March 13, 2000 next to a newly felled area in an old-growth mixed stand on a mountainside above Hope, British Columbia. 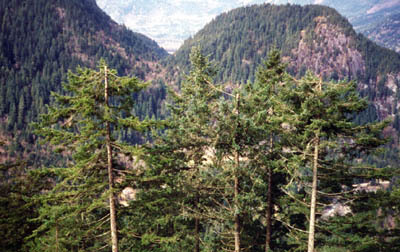 Trees next to a clear-cut area need desailing to increase their resistance to blowdown. 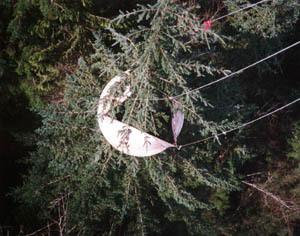 The Fandrich topper removes the most wind-sensitive part of the treetop. 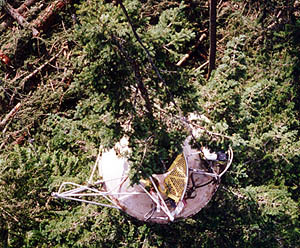 A hydraulic shear severs the treetop in about six seconds. Pilots can cut 100-120 treetops per hour. The trunk is left neat and clean. The Fandrich topper cuts treetops up to a diameter of 9 inches. 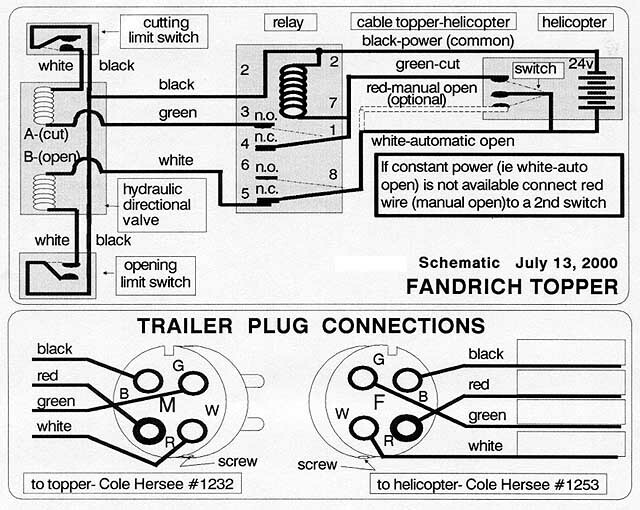 "IB#22: Operating Instructions — Fandrich Topper" is available in PDF format. To view it, please click here.